Classy restaurant, skilled chef add up to a fine restaurant experience. : Chef Patrick Bazin, formerly of The Occidental in DC, offers an American bistro menu with starters like a crabmeat spring roll and a barbecue duck quesadilla with chipotle cream dipping sauce. Luncheon mains include a chicken potpie and grilled meatloaf. Dinner entrées are more substantial and include red wine braised short ribs. Desserts are few, but well-suited to the menu. If you hanker for chocolate, the flourless chocolate cake is supremely rich, but the Key lime pie with its coconut crust makes a tropical statement. The restaurant has a very selective wine list plus its own wine bar --- worth a visit and a sip. As interesting as the food is, the décor also merits mention: open kitchen, brick walls, vaulted wood-beam ceilings and subdued lighting. 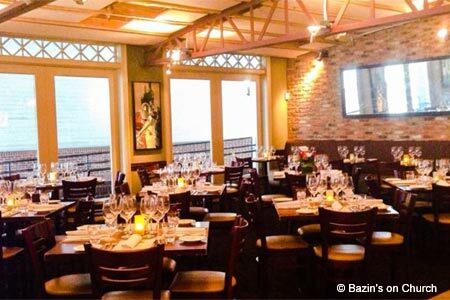 Wine dinners are offered, too, and Bazin's Next Door accommodates private parties and intimate gatherings for lunch or dinner every day of the week; it also offers taco "popups."